Francisco’s parents migrated from Italy to Brazil to work in coffee farms before he was born. After his father left the family when Francisco was 10, he, his mother and brother, moved to Sao Paulo. When Francisco was an adult, the State Department of Agriculture hired him to monitor coffee exports, due to his knowledge as a coffee picker and worker. “I used to sit in his lap when I was a child to listen to his stories about the life at coffee farms. Stories about animals, the wildlife, the shipments to the port of Santos by steam trains. All of that created a world of fantasy in my mind. I have the highest respect for everyone involved in agriculture, especially at coffee farms,” Marcelo says. Minas Hill values the opportunity to contribute to the Brazilian coffee industry, and that each of its three main farming partners distribute their money throughout local communities in various ways. “Every one of them has at least one social or environmental project in place in Brazil, and supporting them is crucial for the quality of the coffee and wellbeing of the workers,” he says. Ismael Andrade of Sao Silvestre, Capim Branco and Paraiso farms in the Cerrado region is a long-time philanthropist of his local hospital, Santa Casa de Misericordia in Carmo do Paranaiba. “People who visit the [Santa Casa de Misericordia in Carmo do Paranaiba] will see a framed photo of Ismael from when he was 18 and began assisting the hospital,” Marcelo says. Roasters who purchase Ismael’s coffee from Minas Hill can donate to the hospital anywhere from five cents to $1 on top of every kilogram they buy. Pedro Gabarra of Santo Antonio and Pinhal farms in Campo das Vertentes runs five different social projects at his farms. One of these projects is Wings, which rescues and recovers injured and captured birds in the area. “In Brazil, hunting and keeping animals in captivity is illegal, but people still capture local birds and fauna and keep them in cages. Animal rescuers take these birds to Pedro’s farms where they are looked after until they can be released,” Marcelo says. 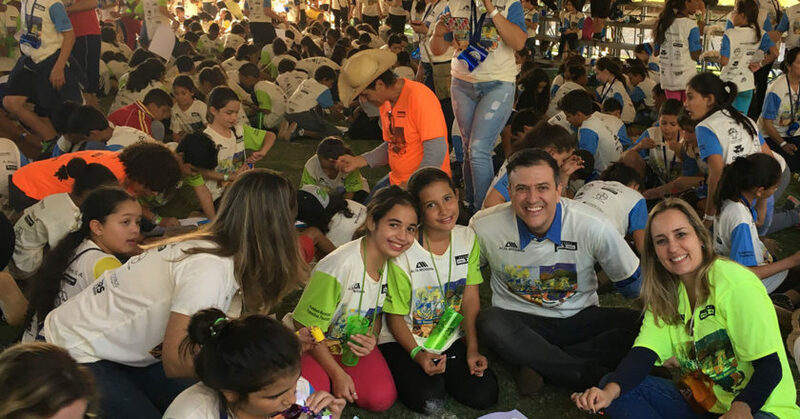 Marcelo declares that the project that captures the most interest from Australians is GIMA (Intercity Games for the Environment) from Flavia and Gabriel Oliveira of Bom Jesus farm in Alta Mogiana. GIMA aims to promote social and environmental responsibility and to create environmental awareness from early generations. Almost 1000 children attended its latest edition. Fifth grade children from the local area take part in a day of events where they perform plays and non-competitive games. At the end of the day, they are given push bikes to help them go to school because there is no public transport in rural areas like Bom Jesus. Marcelo says this project has a special place in his heart, as his grandfather was born in the Alta Mogiana region. “The project works with the future of coffee. We need to take care of the next coffee generation. Roasters want quality and sustainability, and this is exactly what Minas Hill Coffee offers them,” he says.